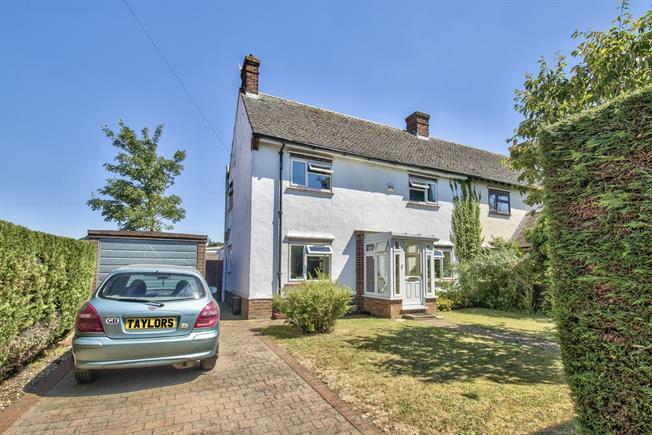 3 Bedroom Semi Detached House For Sale in Huntingdon for Offers in excess of £325,000. Taylors Estate Agents are delighted to offer for sale this extended three bedroom family home within the popular village of Brampton. Internal accommodation comprises of entrance porch and hallway, dining room, playroom, lounge, family room, kitchen, utility room and shower room. The first floor comprises of three bedrooms and three piece bathroom. Outside the property boasts an extensive rear enclosed garden with patio area, enclosed front garden and driveway leading to a single garage. Double glazed UPVC window to front, telephone point, coving to ceiling. Double glazed uPVC window to front. Feature brick fireplace surround with ceramic tiling. Re-fitted in a comprehensive range of base and wall mounted cabinets with complementing work surfaces and tiling, integral cooking range with bridging unit and extractor fitted above, peninsular work surface/breakfast bar, space for fridge freezer, drawer units, single drainer sink unit with mixer tap, double panel radiator, recessed lighting, ceramic tiled flooring. UPVC double glazed construction, double panel radiator, UPVC door to side aspect, appliance spaces, plumbing for automatic washing machine, ceramic tiled flooring. Fitted in a three piece contemporary white suite comprising low level WC, screened shower enclosure with independent shower unit fitted over, extractor, pedestal wash hand basin with mixer tap, ceramic tiled flooring, UPVC window to garden. A double aspect room with UPVC window to front and UPVC French doors to Family Room, TV point, telephone point, single panel radiator, central marble fire place with inset Living Flame coal effect gas fire, coving to ceiling. Double panel radiator, UPVC French doors to garden aspect at the rear, double poly carbonate roofing, TV point, ceramic tiled flooring. Radiator, UPVC window to rear aspect, coving to ceiling. Fitted in a quality range of ‘Sharps’ furniture incorporating wardrobe range, bedside drawers, dressing table, corner shelf display unit, UPVC window to front aspect, radiator, telephone point, coving to ceiling. UPVC window to rear aspect, radiator, wardrobe range, coving to ceiling. UPVC window to rear aspect, radiator, coving to ceiling. Re-fitted in a contemporary white suite comprising low level WC, panel bath with independent shower unit fitted over, UPVC window to side aspect, full ceramic tiling, pedestal wash hand basin, coving to ceiling, ceramic tiled flooring. There is a mature front garden primarily lawned with a selection of established trees enclosed by mature boundaries. Parking provision is for two vehicles accessing the Single Garage with single up and over door, power and lighting. The rear garden measures in excess of 100’ with several areas of paving, central shaped lawn as well as an outside tap and lighting.